I finally arrived in Pisa. It was a beautiful, spring evening and after my long flight, I only had one thing on my mind: food. I was on my own for the night (I finally connected with Lucia after buying my ticket only to learn that she had moved away), so after dropping my suitcase off at my bed and breakfast in Centro, I wandered over to the Piazza dei Miracoli. Assured that the Tower was still leaning, I concentrated on finding the nearest pizzeria. I swear that the inventor of real Italian pizza was one of the most inspired men to ever walk the planet. And pizza followed by gelato? I was in culinary heaven. Afterwards, I walked around, re-familiarizing myself with a city that I used to know like the back of my hand. Memories of the three months I spent there as a missionary flooded back and I found myself impatient for Sunday morning to arrive so that I could see everyone again. Luckily, the fact that I hadn’t slept in almost 24 hours meant I fell quickly asleep – though the next morning, my jet lag kept me in a fuzzy, foggy state. After getting dressed for church I went down for breakfast and started chatting with my host. Wow, was my Italian a bit rusty. While I enjoyed my brioche, nutella and peach fruit juice, my host opened up the shutters and I found the first big surprise of my trip. Now, when I say raining, I mean RAINING. While I had slumbered, a huge storm had hit Pisa. I was still determined to make it to church so against the counsel of my host, I set out into the tempest in my very spring like (and therefore highly weather inappropriate) dress. Rain, wind, thunder and lightning were my companions as I headed to the bus stop. (#5 CEP – I remembered!). It was about a 10 minute walk to the bus and as I arrived, soaked, and looked hopefully at the schedule (with the special arrival times for Sunday), I had the heart sinking realization that it only passed once an hour…and that it had passed 15 minutes before. So now what? The storm showed no signs of abetting, I had at least 45 minutes to wait, AND I was going to be massively late. Was it even worth it? Should I give myself an A for effort and just head back to the B&B for the morning? Or, better yet, head straight to the train station and continue on to the second city in my itinerary? It was quickly becoming less and less of a priority to make it to church that morning. Just as I was about to give up, I spied an archway across the street that led to a little covered alley – and I knew that I would be waiting for the next bus. Wet and shivering I crossed the street and sought this meager protection from the elements. Never had 45 minutes passed so slowly. So many moments to berate myself for not checking the schedule before I left the states, for not packing warmer clothing, for choosing to make Pisa the first stop of my trip. But I stuck it out, and finally, there it was: Bus #5. Luckily I remembered the right stop, and started the short trek to the chapel. An hour late to a three hour meeting, I arrived just as Sunday School was about to start. As I walked into the chapel I had the overwhelming realization that a long time had passed since I had been a missionary here, and while I remembered many of the faces, I didn’t remember a lot of names. And with Lucia gone, I didn’t feel an overwhelming connection to anyone there. And since I was by myself, I didn’t even have a traveling companion to be awkward with. So I was just awkward by myself. The awkward American. Classic. The second hour passed and I still felt pretty out of place. Maybe this hadn’t been such a great idea after all. I mean, it had been 6 years since I had been a missionary there and since I hadn’t been the best of staying in touch, it wasn’t surprising that I felt out of place. Then, as I was moving into the main part of the building for the third and final meeting, trying to be as inconspicuous as possible, something caught my attention. Out of the corner of my eye I saw this guy circling the room, obviously busy setting up for the meeting. Tall, handsome…he was a nice distraction from all my feelings of awkwardness. As the meeting started he sat with the leadership, and I resigned myself to the fact that he was probably married. But, I confess, that didn’t stop me from looking. When the meeting ended, I had plans for a quick escape. After all, there was no need to prolong the agony of all the awkwardness, was there? I didn’t plan for the natural inquisitiveness of the Italians. I mean, there I was. Obviously American. Obviously by myself. Obviously not the typical tourist who passed through. There had to be a reason I was there. As I tried to make my way out of the chapel, I was stopped by a sweet, and very determined, signora. In my ridiculously jet lagged Italian I started answering her questions. How I had been a missionary at that church 6 (!!) years before, how many great memories I had at that time, how I had come back for a wedding and had decided to stop by. The ice had been broken. With all the classic enthusiasm that makes the Italians such a warm people, she proclaimed herself ecstatic that I was back. How exciting that I had remembered them! And then she grabbed the person walking by. And the next person. Loudly introducing me to anyone in hearing distance, and explaining my story. Suddenly I was surrounded and being warmly welcomed back to Pisa. Within minutes I had been re-introduced to the faces that had seemed familiar, was catching up with the people I had worked with and meeting those who had started coming after I left. During this time, I couldn’t help notice that the mystery guy kept passing by. He had definitely not been around 6 years ago. But as I was now in the middle of a very friendly and enthusiastic group of people, I didn’t see any chance (without being totally obvious) of finding out who he was. As I finished catching up with one church member, I felt a light tap on my shoulder. I turned around, and there he was. My heart skipped a beat and I couldn’t help staring. Then, stammering and completely flustered, I introduce myself. Luckily, he didn’t pass me off as an idiot. And we started talking. Or, rather, he started talking and I scrambled to make my jet lagged brain function enough to be coherent. Obviously he hadn’t heard the explanation. Or he was playing it cool so that we had something to talk about. So I launched into my explanation. And the conversation continued. When he had moved into the area, what we both did for a living, how tall I was (he found this remarkable and amusing at the same time), about life in America. Though I quickly determined that he wasn’t, in fact, married, I was also convinced that I was making a horrible impression. However, even though we kept getting interrupted – someone who needed him for church business, someone who had heard that I was there and wanted to say hi – he never left my side. And I couldn’t stop talking to him. 10 minutes passed, 15, 20, and the conversation kept going. Then, finally, duty called. Someone needed him and he had to leave. I was taken aback. True, he had caught my eye from that first moment. And there was a definite spark during our conversation. But he was Italian. I was American. And I was leaving on the afternoon train. There was no logical reason why I should let him write me. We exchanged information and went our separate ways. As I left the church, I had this odd feeling that I should have found a way to spend more time with him, that I was missing out on something. But that was crazy. He was just a cute guy to flirt with on vacation, right? Sure, he had said he would write me, but I honestly didn’t believe that I would ever actually hear from him again. I headed back to the B&B to change and get my suitcase, but I couldn’t get him off my mind. Walking to the train station I had fantasies of running into him, imagining ways that I could see him again while I was there. But that was silly. Get a grip. You didn’t come here to meet a guy. Focus. I boarded the train to Florence and set my sights forward to the rest of the trip. 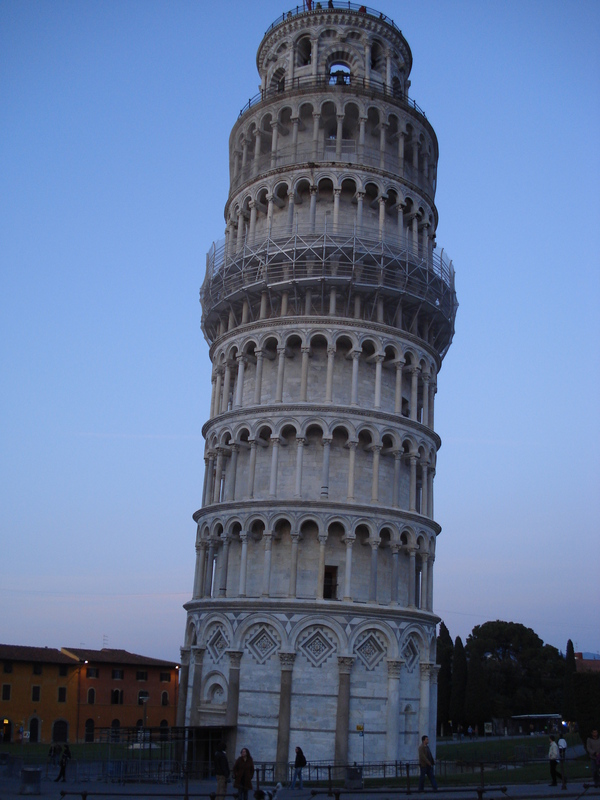 This entry was posted in 2010, Choices, Italy, Lucia, Mario, Pisa and tagged awkward, bus, Choices, church, encounter, flirt, Italian, Italy, Mario, memoir, memories, missionary, Pisa, plane ticket, travel. Bookmark the permalink.